What better way to feel alive than to be scared? And I don’t mean “Oh no something pop up and scared me for a little while” kind of scared. I mean being disturbed to the point where you can’t stop thinking about it. If you are looking to spend a whole week looking over your shoulder, I suggest you play Silent Hill 3. I have played Silent Hill 1 and 2 but I believe that anyone can play the third one and have fun, or as much fun as you can have while crying for some one to help you out. So, I will say this though, I have never been more scared of a game than this one. I will not however reveal the surprises awaiting for you in the game, that would just spoil it for you. Instead I will tell you about why you should play this nightmare. Lets start where we usually start, the story. If you think that there are messed up people around you, wait till you meet the characters inside this lovely world. The story mainly takes place in the main character’s town and Silent Hill, if you hadn’t guess it yet. 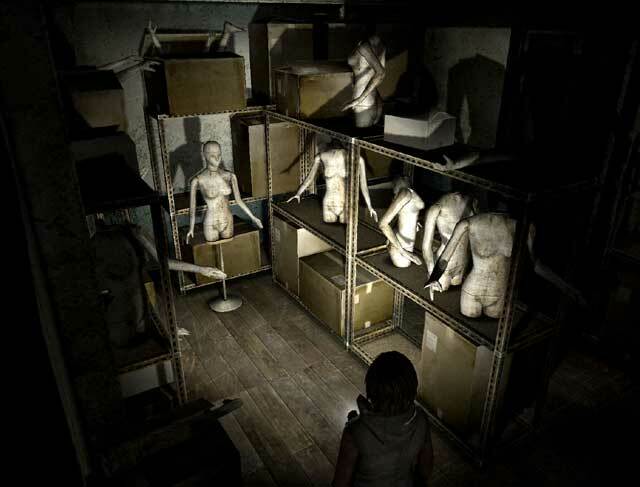 As you start the game, you will find yourself trap inside a mall. Weird things will happen, weird people will suddenly know who you are and tell you about things you do not quite understand. You will do your best to ignore these people, and try to go home. It won’t be an easy task. Even though not much will be revealed at the beginning, the story will unfold as you go forward. And it is a great story that will keep you on your toes and asking questions. You will be looking for more answers that the ones that are given and that is just great. I would say that half way through the game you will finally arrive at Silent Hill and that is when most of your questions will be answered. The characters are unforgettable There aren’t many of them, but each has a very unique personality, motives, and traits that set them apart. You will get to know them very well as you go through the story. Although sometimes they may come as caricatures, for the most part they are very convincing. By the end you will either hate them or love them. The whole game in itself isn’t very long, I would say that 10 hours is what the first run through might take you depending on the difficulty you chose. Unless a particular monster or puzzle kept you pinned down. But you can choose the monster to be easy to kill and the puzzles hard to solve, or the other way around. This is a great option because it allows you play the game without penalizing you if you don’t want to fight monsters or solve impossible puzzles. The game is one big puzzle, so if you though you could just bash your way forward, you will be disappointed Exploring is key in order to finish the game. Opening every door, will prove to be much more useful than just going where you think you need to go. There will be some back tracking as you remember where items are and how to get them. Monster will make this whole process harder than it needs to be and you will just be very angry at times. These item gathering will be easy enough to figure out. It’s the puzzles with codes that will make you want to split someone’s head open. For the most part, thinking really hard will pay off and you will be able to move forward. There is one exception that almost ruined the rest of the puzzles for me. It was one of the very first puzzles and it could not be solve by mere logic. All I will say is that if you aren’t familiar with a certain author name Shakespeare, you better start reading on the guy. Aside from that one puzzle that requires knowledge rather than logic, the puzzles can be solved within a reasonable time frame. The point that makes this game a really disturbing game is the look of it. The story does contribute to the general bad omen feel of it, but the look and things that happen is what really sell it. I will not say much more than there are some rooms that will haunt you for a while. Even after you finish the game. They just get in your head. AND THAT IS ALL I WILL SAY!!! I wont spoil it for anybody, play the game and see. It is creepy but really worth it. You will have an amazing story to tell about how you wet your pants and threw a cat across the room when it jumped on your lap. Now, as great as this game’s story and creepiness is, it does have some points that work against it. The biggest issue there is, is the camera. It will drive you insane. It will be in a different position when entering a room and it might make you leave it by mistake. Some times pressing down makes you go up and when the camera switches you have to keep pressing down or the character will change positions. It will get you killed at times. The other frustrating thing is the way that sometimes the character is just facing one pixel away from something and so it does not activate the right action. It can be so annoying. Especially when using something from the menu and it keeps telling you she can’t use it because she is one pixel away. The final point which you will hate its the noises that you make as you walk. For some reason they are extremely loud, especially when going over grids of any kind. But for all its bad points the game has many more good points. If they do bother, they never bother you all at the same time, and for the most part it won’t really bother. This is a game that I recommend to anybody who loves scary games. If you happen to like survival, puzzle solving games that include horrific settings, it’s even better. It is not made or everybody though. If you jump out of your chair at the smallest sounds or are still afraid of the dark, don’t play this game. It will only fuel your nightmares. Well it will either way but if you can’t handle horror all that well, don’t play it. But if you want to be scared, play it and see for yourself. This entry was posted in Reviews and tagged afraid, creepy, hill, monsters, nightmares, puzzle, puzzle-solving, scary, silent, silent hill, solve. Bookmark the permalink.